South Carolina SC Accommodations SC Vacation Rentals Myrtle Beach Vacation Rentals Myrtle Beach is located along South Carolina's northern coast, about 25 miles south of the North Carolina border. It forms the heart of the Grand Strand region, which stretches from Little River to Georgetown. 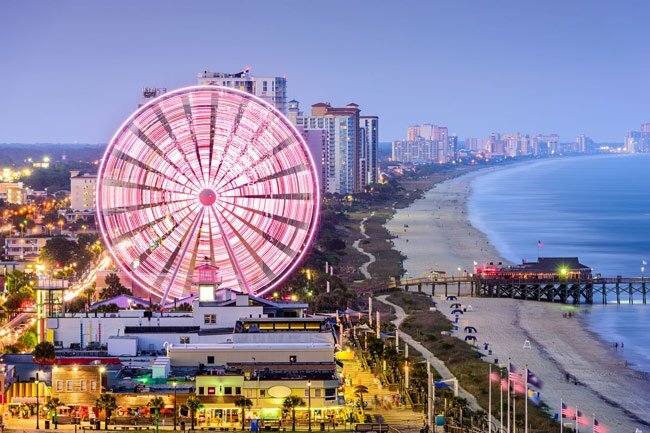 In addition to 60 miles of beaches, the Grand Strand is home to world-class shopping and more entertainment attractions, golf courses, and restaurants than any other beach area on the East Coast.